On the opposite bank of the river is Charleville, the handsome mansion of the Earl of Rathdowne. The demesne, which participates in the attractive features displayed in the romantic scenery of Powerscourt, extends over twelve hundred acres, and is adorned with noble forest-trees. 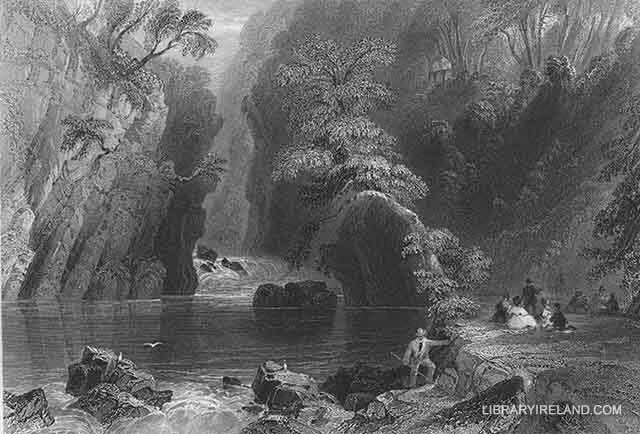 Pursuing the course of the river downwards from the waterfall, the tourist arrives at the spot where its waters emerge from a deep ravine, the precipitous sides of which are clothed with luxuriant oaks, through whose thick foliage masses of rock occasionally protrude their rugged forms over the chasm beneath. This romantic glen, which is considerably more than a mile in length, takes its name of "THE DARGLE" from the river which flows through it. Entering the majestic woods by a path cut through them, and which overhangs the stream, we obtain at every opening in the trees views of unparalleled beauty and variety, the prevailing features of which partake in a great degree of the sublime. The opposite side of the glen appears one mass of thick foliage rising precipitously from the brink of the river, whose progress is heard, but whose bed is sunk so far below the surface of the woods in which it is lost, that one might suppose, without any extraordinary stretch of the imagination, it was a river in some inner world, laid open by a Titanic throe, that had cracked asunder the rocky crust of this shallow earth;—the soil, and the deep-striking roots of the trees terminating far above us, looking like a black rim on the enclosing precipices. When occasionally we catch a glimpse of the troubled waters through the gleam of the overhanging woods, they afford no silvery relief to the solemn grandeur of their majestic channel, but taking a sombre tinge from the shadow of the impending precipices, "boil and bubble" darkly over their rocky bed. About midway down the glen, a huge mass of rock, projecting at a great height over the river, has received the name of "The Lover's Leap," though we confess to not having been able to discover that any heart-stricken swains or damsels were ever silly enough to follow the example of Sappho, by precipitating themselves from the dizzy precipice. The prospect from this spot is magnificent, and the most vivid powers of imagination must fail adequately to describe a scene of such exquisite beauty as here spreads before the view. The eye from this elevated site comprehends every part of the deep glen below, catching at intervals the river breaking over fantastic fragments of rock detached from the cliffs above. To the left, the glen gradually expands into an open campaign country, bounded in the distance by the blue expanse of the sea; to the right, the vales and hills of Powerscourt, richly verdant and adorned with majestic timber, and hemmed in by lofty and rugged mountains, form an interesting and noble landscape. Another new and splendid view of THE DARGLE is obtained from a small patch of green sward at the bottom of the glen, close beside a broad pool, in which the waters of the river, dammed in by a ledge of rocks, sleep in unbroken tranquillity. Looking up the stream, the waters are seen tumbling through a rocky channel from the dark woods, which, rising to a vast height on either side, exclude every other object. Perched on the shoulder of a precipitous cliff, the thatched roof and rustic pillars of a charming little cottage, called the Moss House, peep through the foliage of the trees that grow above and beneath it, and form a singularly pleasing object in the landscape. This beautiful spot is a favourite haunt for picnic parties from Dublin:—on the smooth turf which spreads its inviting carpet beside the clear stream, many a happy group may be seen, in the pleasant summer-time, laughing, dancing, singing, or dining al fresco, with that perfect contempt of care or ceremony which so strikingly distinguishes the light-hearted people of this country.